Elastomeric Roofing - Old Dominion Roofing & Construction, INC.
Elastomeric Roof coating is water proofing sealant used to repair roofing on on flat roofs and metal roofing . This energy efficient sealant repairs, water proofs and restores roofing and is cost effective. Used on seams, around HVAC systems, drains, exposed ducts, sunlight’s, ponding areas to keep a flat roof system leak free. Elastomeric coating extends the life of the roofing system. There are many elastomeric roof coating available and our commercial roofing experts can recommend to you the best product for your roof based on your budget and time restraints. Old Dominion Roofing & Construction, Inc. has been serving the commercial roofing needs of businesses across Virginia since 1984, so you can be sure you have found the right roofing company for your business. 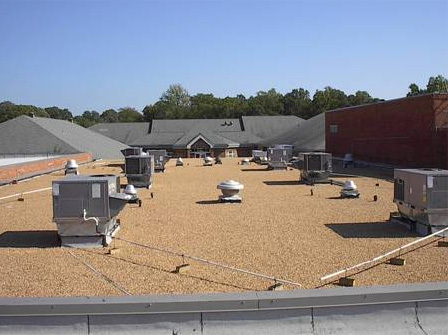 We know commercial roofing We have been installing low-slope (flat roofing) across the Virginia region to include; Warehouses, Public Libraries, K-12 schools, Correctional Centers, Armory’s, Condominiums, Municipal buildings, Historical Structures to name a few. Old Dominion Roofing & Construction, Inc. is your roofer of choice for commercial roof replacement services. For more information about elastomeric roof coating repairs and maintenance call 804-225-7164.